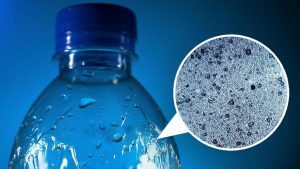 The World Health Organization is launching an investigation into the safety of bottled water after a new study found an average of 325 pieces of plastic per liter of water in 11 of the world’s most popular brands. More than 90% of the 259 bottles tested contained microplastics. Only 17 bottles were microplastic free. An earlier study also found high levels of microplastics in tap water, but bottled water contains roughly twice as many plastic particles per liter. In one bottle of Nestlé Pure Life, concentrations were as high as 10,000 plastic pieces per liter of water. The brand Boxed Water contained an average of 59 plastic fibers per liter. Fiji Water had 12 plastic fibers per liter. Tested brands included Aqua (Danone), Aquafina (PepsiCo), Bisleri (Bisleri International), Dasani (Coca-Cola), Epura (PepsiCo), Evian (Danone), Gerolsteiner (Gerolsteiner Brunnen), Minalba (Grupo Edson Queiroz), Nestlé Pure Life (Nestlé), San Pellegrino (Nestlé) and Wahaha (Hangzhou Wahaha Group). The most common type of plastic fragment found was polypropylene, used to make bottle caps. The bottles analysed were bought in the US, China, Brazil, India, Indonesia, Mexico, Lebanon, Kenya and Thailand. The Story of Stuff recently commissioned a similar study that examined 19 consumer bottled water brands in the US. “Plastic microfibres are easily airborne,” said Abigail Barrows, lead researcher for the Story of Stuff. Coca-Cola told the BBC it had strict filtration methods, but said the widespread presence of microplastics in the environment make them nearly impossible to keep out of even “highly treated products”. A Gerolsteiner spokesperson said his company could not rule out plastics entering from airborne sources or packing processes, but said concentrations of plastics in Gerolsteiner were lower than those allowed in pharmaceutical products. Want the cleanest, most mineral-rich water on Earth? Get some glass jugs and go fill them up at a spring near you.